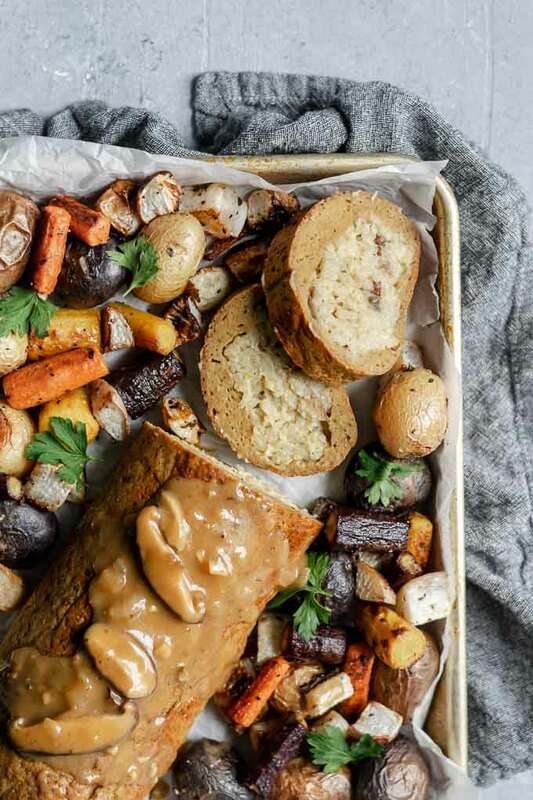 Every holiday feast deserves its own seitan roast. A savory, chewy, protein-heavy main event to complement the half dozen or so sides that laden your table. It’s one of those dishes that makes it look like you spent hours in the kitchen and people might think they couldn’t possibly replicate your effort, but I’m here to tell you that just isn’t so! 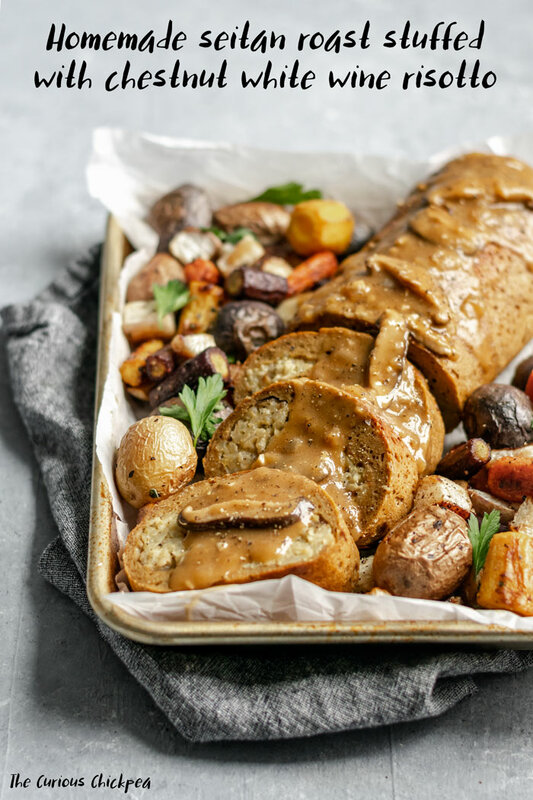 This seitan roast is stuffed with a deliciously creamy chestnut and white wine risotto. It’s a rich tasting filling with bursts of sweet buttery chestnuts, the risotto is sure to impress all on it’s own, but somehow its even better when wrapped in seitan and smothered in savory mushroom gravy. 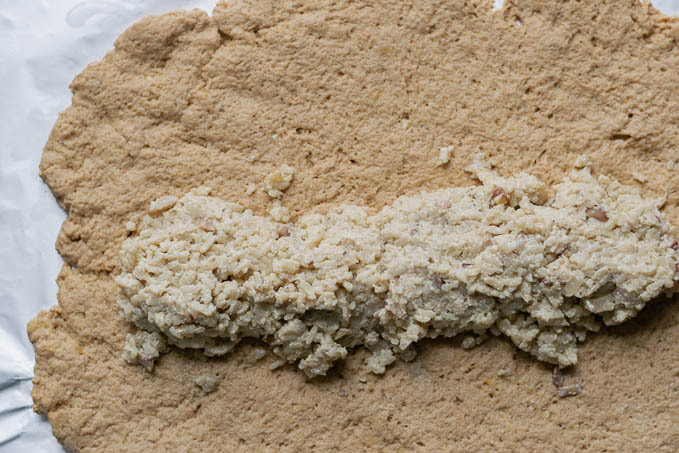 Making your own seitan is surprisingly easy and non fussy. But before we can get to making the seitan you’re going to want to prepare the risotto. Risotto is one of those dishes that intimidates people, but it’s actually very simple. All you need is time, a little patience, and the ability to test the rice towards the end to make sure it’s fully cooked. First we start by cooking the aromatics, sauté onion until soft and translucent, maybe just starting to turn golden in spots. Add the garlic and let that cook long enough to mellow the sharp bite, all it tastes is 30 seconds to a minute. Then add the rice and the spices, dried sage and dried thyme, salt, and a generous portion of black pepper. Stir to coat the individual grains of rice in oil and briefly toast the spices. Now we start the process of slowly adding liquid and stirring while the liquid absorbs. Start with the white wine (if you want to keep things alcohol free you can just use more vegetable broth), pour it in and stir while it cooks into the rice. The broth should be kept warm on a nearby burner while you make the risotto. Add broth by the ladleful (about 1 cup at a time), and let it cook into the rice. With each addition watch the rice turn a little more translucent and plump up. By the end there shouldn’t be any dark white center to the grains of rice which would suggest an undercooked center. There is no need to stir non-stop while the risotto cooks. Stir frequently, but you can take breaks between stirs. As you near the end of the process of adding broth you will find that you need to stir more frequently so that the rice doesn’t stick to the bottom of the pot. Once all the broth has been added the rice should be fully cooked and the liquid should be fully absorbed for a thick and almost sticky texture. Taste the rice to make sure this is the case. If not, warm up a bit more broth and add it until the rice is fully cooked. Then, add the cashew cream and chestnuts and cook until the cream has absorbed and the risotto is ultra thick and creamy. Cashew cream is my favorite substitute for a heavy cream when it comes to creamy sauces and risotto. The starches in the nuts thicken to a silky texture when heated and making it yourself allows you to control for the thickness of the cream. I prefer a 1:1 ratio of cashews to water for the cream in this recipe. If you have a high speed blender this means dumping in a cup of cashews with a cup of water and blending until smooth. If not, you’ll want to soak your cashews in advance. 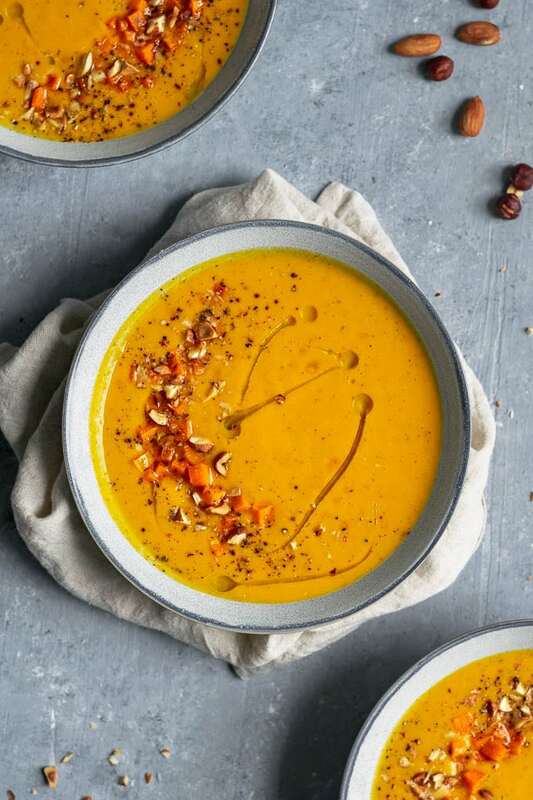 There are a bunch of ways to do this but the fastest is to pour boiling hot water over the cashews and let them soak for at least 30 minutes before draining that water and adding the cashews to the blender with a cup of fresh water. You may also require a bit more time to blend for that creamy texture. 1 cup of cashews might make a bit extra cream, but I can always find a way to use it in another recipe or you can add a little extra to the risotto. My blender has trouble if I try to make a smaller amount, but if you have a smaller blender you can whip up just the amount you need. The risotto can and should be made in advance. You at least want to give it enough time to cool before filling your seitan roast, but why not make life easier and make the risotto a day or two early! Ok now comes the easy part! Get all the ingredients out, preheat the oven (350 ºF), and prepare your aluminum foil–two 18″ long sheets overlapping by about 6″. In a blender combine all ingredients except the wheat gluten and the nutritional yeast, which you stir to combine in a large mixing bowl. Blend them up until the beans are pureed and the liquid is fairy smooth and then add it to your dry ingredients. 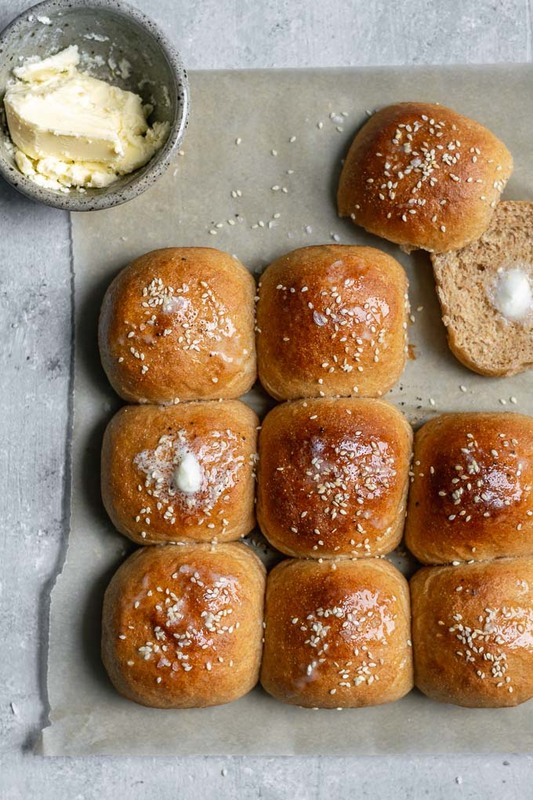 Stir the dry and wet ingredients together using a wooden spoon to combine, then switch to your hands and gently knead to bring it together to a soft dough. If you end up kneading it a bit extra than the recipe calls for, the dough continues to firm up and will need to relax for 10 minutes or so before it can be rolled out. This will result in a denser but still delicious seitan than is shown here. 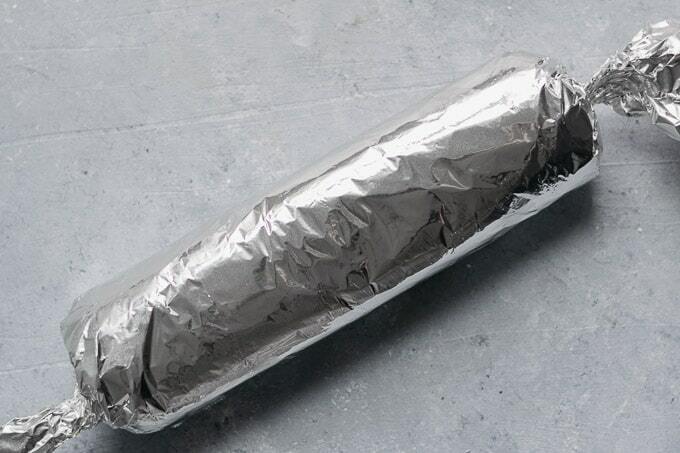 Turn the dough out onto the prepared aluminum foil and use a rolling pin to roll it into a big rectangle, about 14″ long and 12″ deep. Distribute about 2 1/2 cups of risotto about one third of the way from the bottom of the long edge, leaving 1-inch on each side. The risotto should be anywhere from cool enough to touch (lukewarm) to cold from the refrigerator when you add it. Fold the bottom edge of the seitan over the risotto and bring the top portion down to cover it. 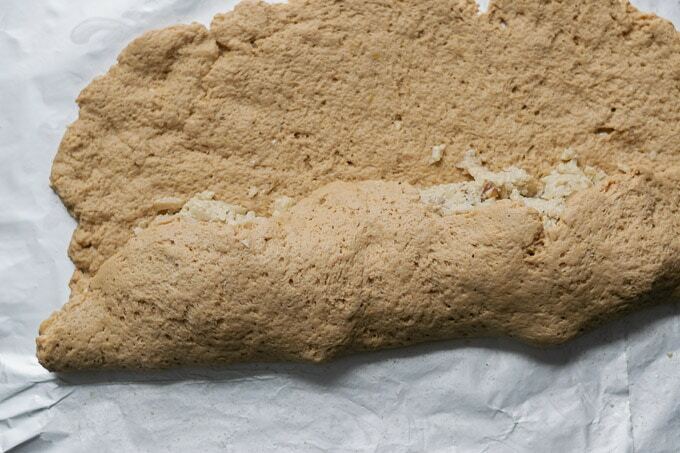 Pinch the ends of the seitan roll together as well as the seam across the roll. Then, tightly roll the foil around the seitan to form a log and twist the ends. 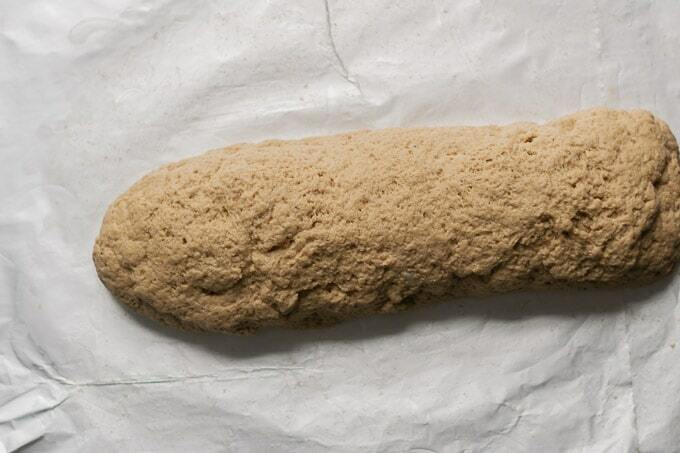 Place the seitan on a baking tray and bake at 350 ºF for at least one hour and 20 minutes. Rotate the roast every 20 minutes so that it cooks and browns evenly. After the first hour and 20 minutes, take the roast out and poke the seitan (use the backside of a spoon or something so that you don’t burn your finger!). If the seitan is very squishy the roast needs more time to bake. Rotate it and give it another 10-20 minutes. Once the roast feels quite firm and not squishy or jiggly (some give is normal, but it should feel firm) it’s done! Let it rest 30 minutes (no less than 15 minutes) after it comes out of the oven before unwrapping from the foil and serving. 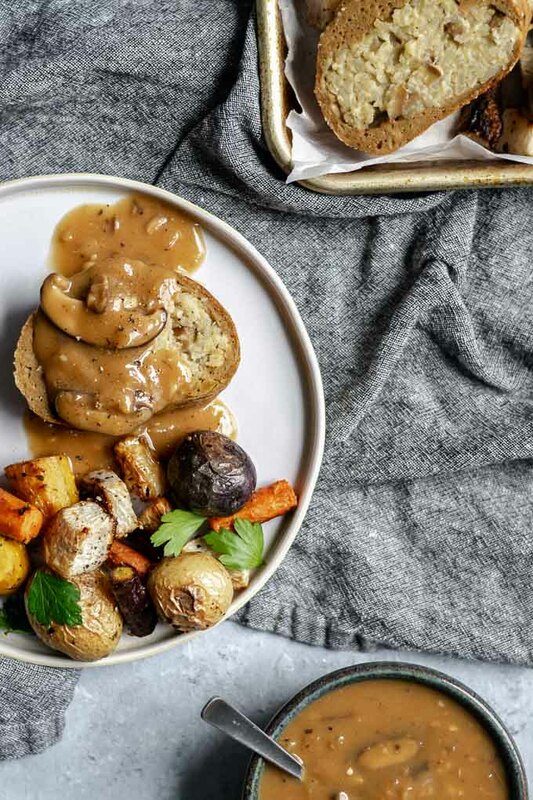 Now, if you’re going to make a seitan roast, you also are going to want to make a flavorful gravy to smother it in. Chances are you have some mashed potatoes on the table that need gravy too! So, make this mushroom gravy, you won’t regret it! It’s easy as 1-2-3, or, rather, sauté some onions then garlic, then the mushrooms, then deglaze the pot with a splash of balsamic vinegar and soy sauce. Melt in some vegan butter (use more olive oil if you don’t want to use vegan butter), and sprinkle over the flour. Cook so the flour toasts a bit and loses its raw aroma, then slowly stream in the broth while stirring. Simmer for a few minutes until it’s thickened, taste and add salt and pepper to taste. I always recommend using a generous amount of pepper! Gravy can always be made in advance and then reheated stovetop, adding a little more water or broth to thin if necessary (wait until it’s warm before deciding!). Use the gravy generously over the seitan! If you don’t have a bunch of sides going with the seitan roast a tasty and simple option is to roast up some root vegetables to serve alongside. Cut them up to be similar sizes, toss in olive oil, salt, and pepper, stick a few sprigs of thyme in there, then lay on a single layer on a baking tray and roast at 425 ºF for 30 or so minutes, or until everything is tender. 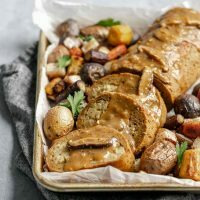 This seitan roast stuffed with chestnut white wine risotto makes an impressive and really delicious main dish for any feast! Friendsgiving, Thanksgiving, a holiday dinner party, Christmas. Stuffed with risotto, it’s something everyone will enjoy! Plus 1 roast makes 12 servings, so it’s a pretty great way to feed a large group of people! Or a smaller group of very hungry people 🙂 . 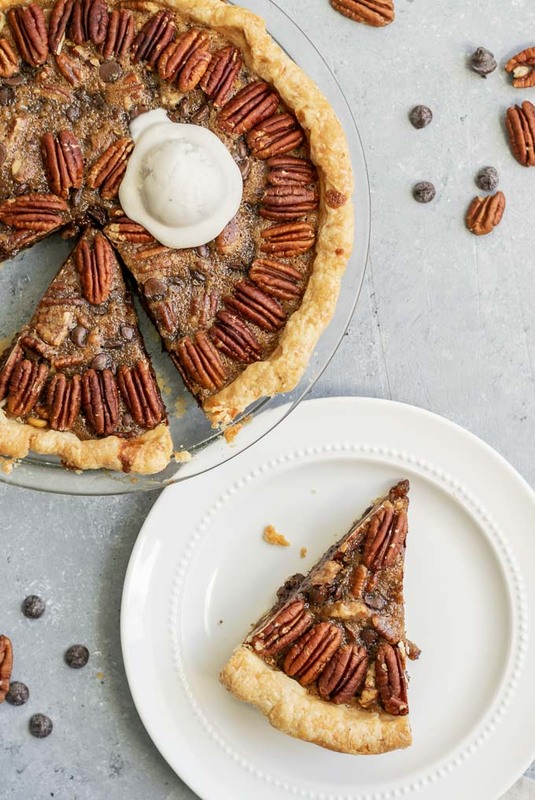 If you try this recipe, leave a rating and comment below! And share your creations with me on Instagram, tag @thecuriouschickpea and #thecuriouschickpea, I absolutely love seeing your photos! 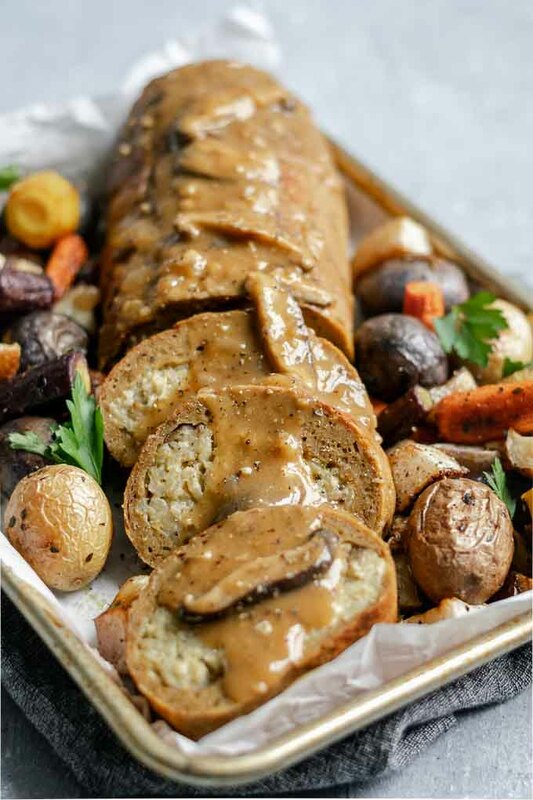 A hearty homemade seitan roast stuffed with delicious savory chestnut white wine risotto makes for the perfect holiday feast centerpiece. Heat the broth over low heat and keep it warm as you make the risotto. Heat a large pot over medium heat and add the olive oil and onion. Sauté the onion for about 5 minutes, or until the onion is soft and translucent. Add the garlic and stir, cooking for about 30-60 seconds. Add the rice, sage, thyme, salt, and black pepper and stir to coat in oil. Add the wine and stir while it absorbs into the rice, about 2-3 minutes. Then, add broth my the cupful and let absorb into the rice fully before adding the next cup of broth, about 3-6 minutes each time. Stir frequently with each addition of broth. It should take about 20 minutes before all broth has been added and cooked in. Add the cashew cream and chestnuts and turn the heat to low. 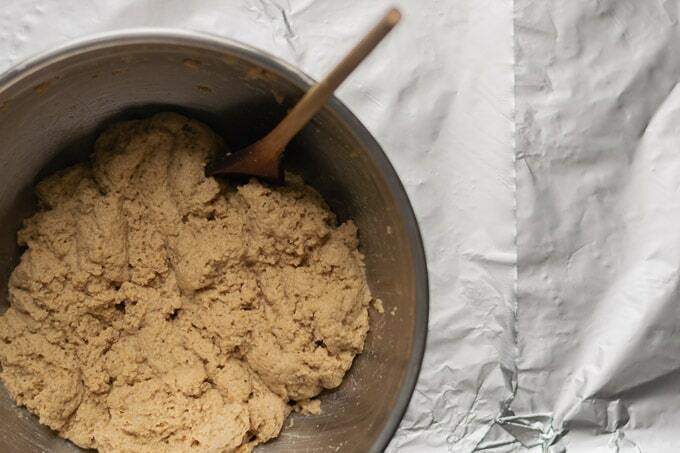 Let cook 3-5 minutes until the cashew cream has absorbed. Taste and adjust salt and black pepper as desired. 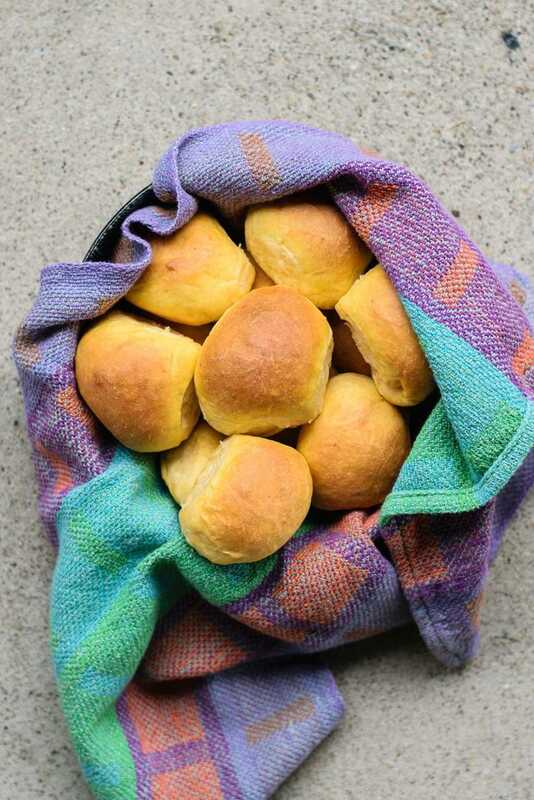 Turn off heat and set aside to cool, or make in advance and store in the fridge. Makes enough risotto for 2 seitan roasts. Combine the olive oil, garlic, broth, white wine, beans, soy sauce, Worcestershire sauce, spices, salt and pepper in a blender and blend until relatively smooth. 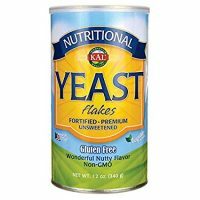 In a large mixing bowl whisk together the wheat gluten and nutritional yeast to combine, then pour in the liquid from the blender. Mix together with a wooden spoon to combine, then gently knead with your hands for about 1 minute until it comes together but remains soft. 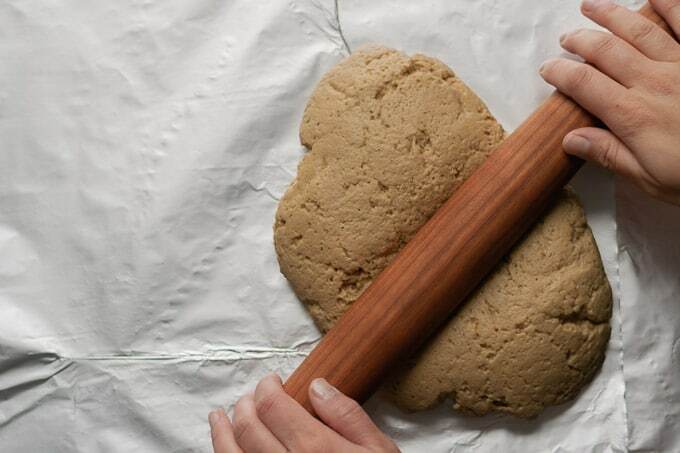 Let rest for a few minutes for the gluten to relax. Overlap 2 pieces of 18" long aluminum foil by about 6 inches. Turn out the seitan onto the foil and roll it into about a 14" by 12" rectangle. If it resists, let it rest for a few minutes then try again. About 1/3 of the way from the bottom of the rectangle, spread out 2 1/2 cups of risotto across the long edge of the seitan, leaving about 1" at each end. Fold the bottom of the seitan over the risotto, then fold the top over. Pinch the ends of the seitan and the seam to seal, then roll tightly in the foil. Twist the ends of foil like a candy wrapper. 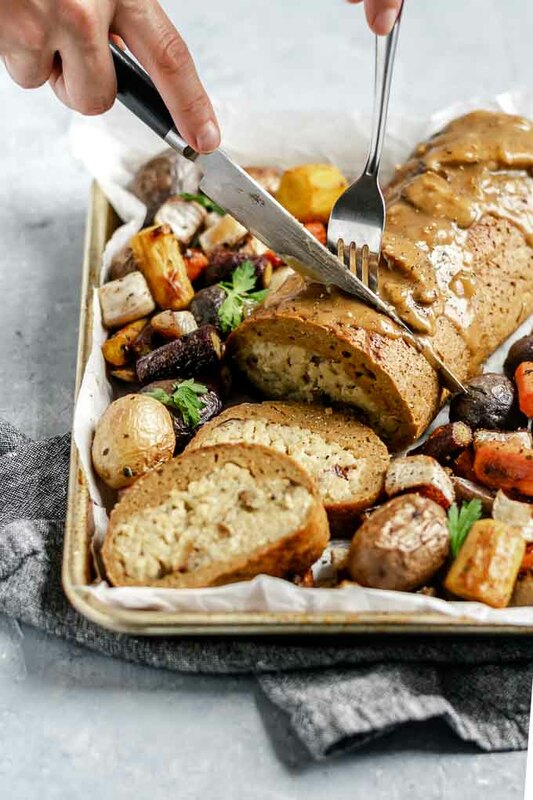 Place the foil wrapped seitan on a baking tray and bake for 1 hour and 20 minutes to 1 hour and 40 minutes, rotating the roast every 20 minutes. Check at 1 hour 20 minutes, the roast will be very firm when done (try poking with the back of a utensil as it's hot!). Give it the time it needs to feel firm and not doughy/squishy. Remove from oven and leave in foil, let sit at least 30 minutes before serving and it will stay warm for at least 1 hour after leaving the oven. To make the cashew cream, soak 1 cup cashews (not necessary if using a high speed blender) for at least 30 minutes in boiling hot water, then drain and blended the cashews with 1 cup of water. Seitan adapted from my homemade seitan steaks. 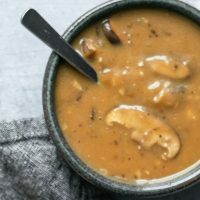 An easy and savory vegan mushroom gravy that's perfect for topping anything from a holiday roast and mashed potatoes to french fries for a homemade poutine. Heat a pot over medium low heat and add the olive oil and onions. Cook until the onions are soft and lightly golden, about 7 minutes. Add the garlic and cook about 1 minute, then add the mushrooms and sauté them until they have released their water and have started to brown, about 5-8 minutes. Deglaze the pan with the balsamic vinegar and soy sauce, add the liquid to loosen the bits sticking to the bottom of the pan and then scrape them up. Add the vegan butter and let it melt, then sprinkle over the flour. Let the flour toast for about 2 minutes, then slowly stream in the broth while stirring. Turn up the heat an bring the gravy to a simmer. Cook until thickened, about 5 minutes. 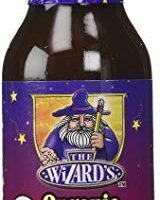 The gravy can be made in advance and reheated to serve. Can this be made in advance and reheated on the day? 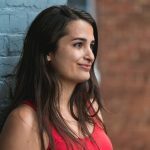 Hi Charlotte, this roast can indeed be made in advance. The only thing to keep in mind is that it can dry out a bit in the oven during reheating. I would reheat it in the foil to keep moisture in, possibly under bake it just a smidge the day before, and add a bit extra gravy to serve. Leftovers do reheat really well in the microwave!